SEO Directories are a very profitable online business model. Create your own business with our money making directory script in minutes and make unlimited amounts of online cash with very little work!. Check this amazing offer and cerate your online business. Kohany Web Directory supports PayPal and dotpay payments. Earn money by selling featured links. Directory can send automatic notifications when the state of added site will change. The script supports multi-level categories and the count of entries in the category. 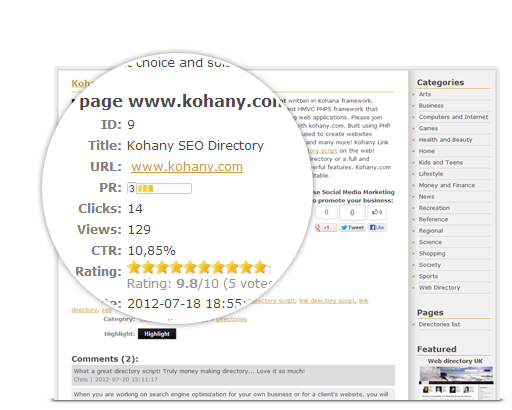 Kohany directory does not have limit of level. By adding the appropriate cron entries, directory can perform tasks such as sending notifications, create a site map. Highlighted entries can be renewed. Cron can send the appropriate notice after the entries expire. Kohany SEO Directory can get thumbnails of the sites. It can also save them on your server to reduce traffic. The script is optimized for seo. It uses cleverly tags such as title, meta description, meta keywords, h1, h2, anchor text, title, etc. 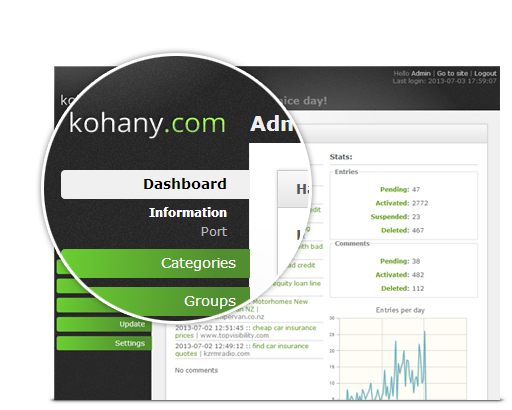 Kohany administrator panel is intuitive and easy to use. You can edit your website right from Control Panel. If you have multiple directories, you can add an entry or multi code to few domains at one time by using remote port. 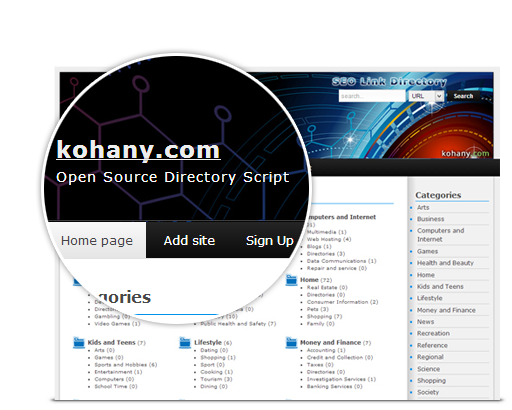 Kohany can be customized with templates. You can quickly and easily make a unique design of your directory. Installation process is as easy as 1, 2, 3! You don't need to be a webmaster to create a beautiful directory website in minutes. Kohany includes an integrated rating system. Script also counts the page views and clicks on a link. The script support multiple languages, such as English, Polish, Portuguese, Spanish. Intelligent validation prevents the addition of low-quality entries by robots.